Nia Harris closes down on an opponent. The sophomore forward has one goal on the season. When Indiana forward Abby Allen walks into Martin Stadium on Thursday night, she’ll have seven goals on the year and the chance to spoil No. 25 Northwestern’s season with a couple more. This time last week, NU was ranked 11 spots higher and was close to the top of the conference, but after losing back-to-back conference games against unranked opponents, the Cats are now a game behind where they need to be in order to qualify for the Big Ten Tournament as one of the top eight teams in the conference. According to sophomore forward Nia Harris, the Hoosiers (7-5-2, 3-4 Big Ten) and Allen — who has the second most goals per game in the Big Ten — are a reminder that the Cats (8-4-2, 2-4-1) still need to find a consistent goal scorer. After NU scored just one goal in two games last weekend in losses to Rutgers and Maryland, coach Michael Moynihan said he’s exploring his forward and midfield options. Because of injuries throughout the season, Moynihan said he hasn’t been able to put out what he thinks is his best lineup and, as a result, has had to toggle through different choices on his front line. After starting two forwards and four midfielders against the Scarlet Knights, Moynihan switched to a 4-2-4 formation, adding Harris and freshman forward Haley Lawson to the frontline to bring more offense to the lineup versus the Terrapins. Moynihan has rotated them with everyday-starters senior forward Brenna Lovera and sophomore forward Kayleigh Stahlschmidt throughout the season. Despite all of the adjustments, no one has scored more than two goals in Big Ten play. Sophomore midfielder Regan Steigleder credited NU’s struggles to the compact defenses they’ve faced over the last month. But that’s a more difficult ability than it appears, as Moynihan said he’s spent weeks trying to put his players in similar positions. He’s tried having Lovera serve crosses into the box instead of receiving them, and he’s empowered senior midfielder Marisa Viggiano, who leads the team with four assists, to fire away in situations she would normally pass. 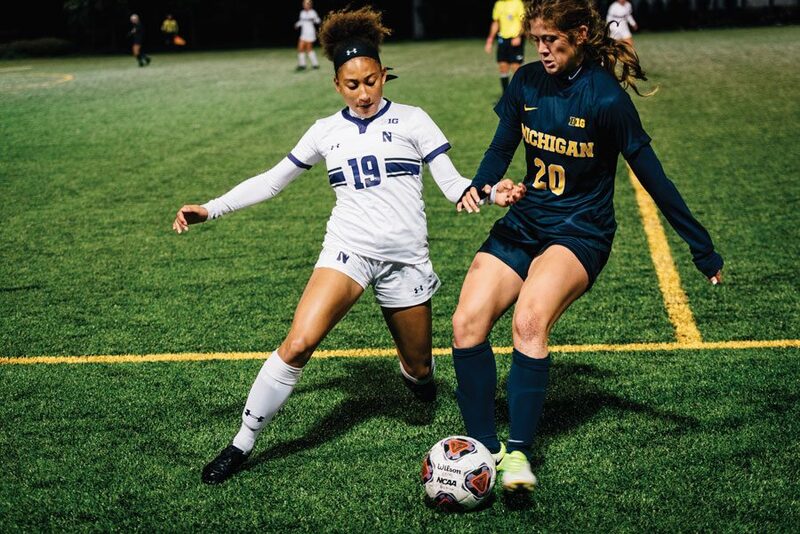 He’s also increased Harris’ responsibility by periodically putting her at the top of NU’s formation and challenging her to use her speed to get to a ball in the open field in front of the opposing team’s defense. But so far, Harris has only scored once and Viggiano has missed all 22 of her shot attempts. Starting with Thursday’s match, Harris said the Cats have only four games left to find their offensive identity.